Sometimes I'm not sure if I'm especially creative or just plain crazy. Last night I decided I wanted ice-cream. I was a good child, however, and decided that instead I would make some variety of fruit soft-serve. This was quickly whittled by memory of Dole Whip at Disney World to a choice for a frozen mango-coconut milk soft-serve. Yes, I realize Dole Whip is pineapple-based. Please don't ask me the correlation. I bought the ingredients, headed home, and came through our garage door past a red-bud tree. The magenta blossoms caught my fancy. I wonder if you can eat red-bud blossoms, I wondered. I quickly googled the answer and yes, in fact, you can eat red-bud blossoms. That's how I ended up the following morning eating flowers in my ice cream for breakfast. I mean, there are definitely worse ways to welcome spring, right? After blending the soft-serve, I popped it back in the freezer for a little while. I was so happy with the tangy, fresh bite of the red-bud flowers. Reminded me of the wood sorrel blossoms we used to eat as kids. 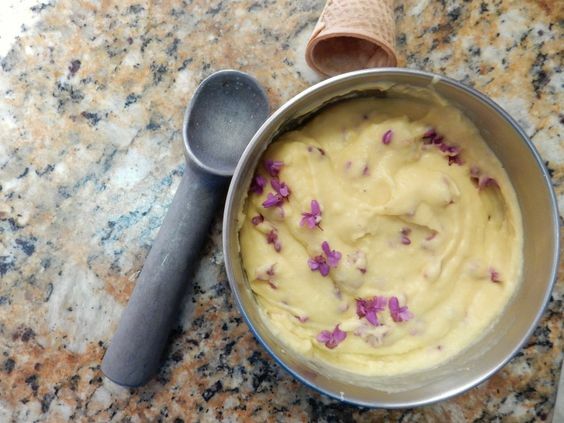 Of course if red-bud doesn't grow in your area, you can definitely use a different edible flower in its place or leave it out altogether. Still, isn't this a beautiful combination? I did kind of go around all morning hoping my google research was accurate and that I wouldn't keel over from poisoning and yes, I did hide the remainder of the ice cream so no family members would get poisoned if it was poisonous. I'm still here, though, guys. So red-bud is edible. And really fantastic in ice cream. You're welcome. The best part of this ice cream besides the beautiful aesthetic would have to be the fact that it is naturally sugar free (apart from the fruit sugars), dairy-free, and gluten free. I'm told that the red-bud blossoms add a powerful punch of vitamin C as well, so there you go. I totally would eat this for breakfast daily if I could. I can't wait to try new varieties of soft-serve beyond my classic chocolate-banana. 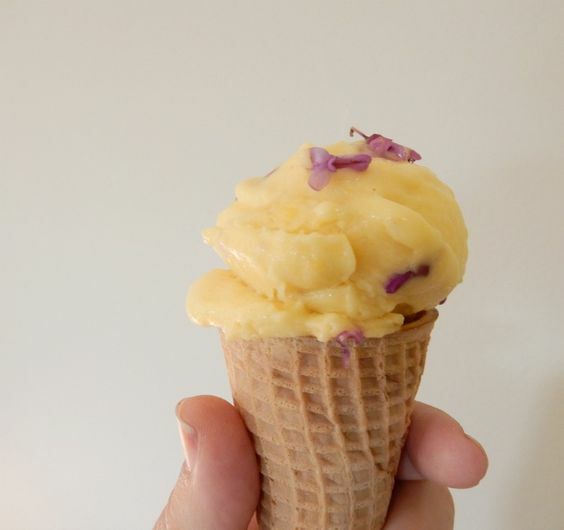 Mango Red-Bud ice cream is my new secret weapon. I feel like I belong in My Side of The Mountain. Yay for foraging and not dying. Blend mango, banana, and coconut milk in a blender until smooth and creamy. 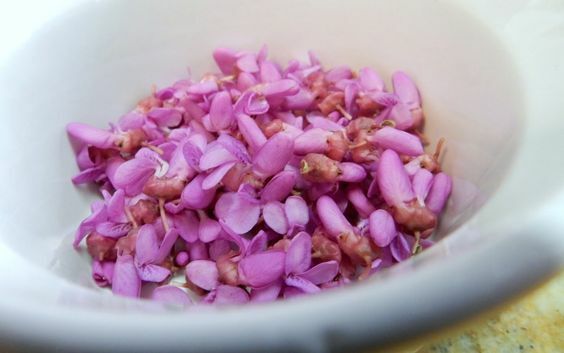 Transfer to a medium-sized bowl and stir in red-bud blossoms by hand. Return to the freezer for half an hour or until you feel the ice cream is firm enough to scoop. Enjoy! As always, before foraging for anything wild and presumably edible, be very very certain of your identification skills, okay? We don't need anybody dying of hemlock poisoning on my account, please. 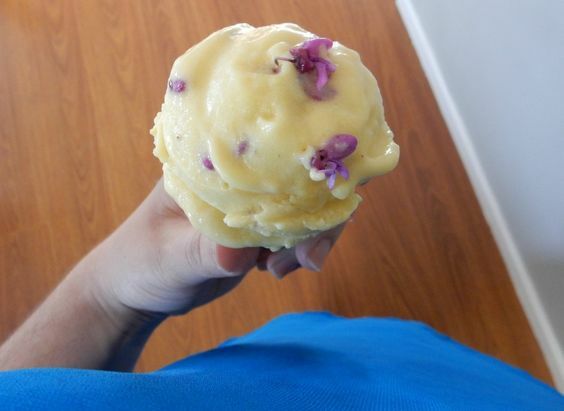 I feel like this, being fruity ice cream and also full of pink flowers, 100% fits your blog title. Correction: I don't have red-buds in my freezer. Those will have to be improvised. I'm so glad you have the goods! It is such a yummy ice cream...I let my family eat the rest of it and was a good girl and didn't hog it all myself. Does Tennessee not have red-buds? I feel like they should. Not sure...but since we don't have one in our backyard, I went without entirely, which is a bit dumb since that was the star of the show. Boo. Yum!! Now I wish I was back in the land of fruit trees. :) that looks delicious and pretty...just how I love my food and treats. Also, foraging is pretty awesome. Good child ;) You are indeed not just a good child but such an artistic one! That is the prettiest soft serve I have ever seen. BTW, when does a fruity soft serve become a sorbet? I love that this is dairy free, and cute too!